It took a game-saving 3-pointer by a previously slumping backup guard for Iowa State to end its 18-game losing streak in Stillwater. Only a few seconds remained in double overtime when DeAndre Kane yanked down the offensive rebound of Matt Thomas' missed 3-pointer and dished to sophomore Naz Long spotted up at the top of the key. Long buried a game-tying 3-pointer with 1.4 seconds left, forcing a third overtime and giving Iowa State the chance to eke out a thrilling 98-97 road victory. That Long was even in the game at the time is a testament to the confidence coach Fred Hoiberg has in him. Before that possession, Hoiberg inserted Long for his outside shooting prowess even though the sophomore had made only 2 of his last 19 attempts from behind the arc over the previous four-plus games. "He's one of our best shooters," Hoiberg told ESPN sideline reporter Holly Rowe after the game. "He has been going through a little bit of a slump, but hopefully this gets him out of it. ... You never know when your number is going to be called. I talk to our guys about that all the time." Long's shot helped Iowa State win in Stillwater for the first time since 1988, so long ago Hoiberg was only a freshman at Ames High School at the time. The Cyclones improved to 5-4 in the Big 12, a very respectable mark considering their last eight games included Kansas twice, Oklahoma twice, road games against Texas and Oklahoma State and home games against Kansas State and Baylor. The Cowboys' position at the halfway point of the Big 12 schedule is not so favorable. An Oklahoma State team once expected to challenge Kansas for the Big 12 crown has lost four of five games and now sits seventh in the league with a 4-5 record. The Cowboys' rotation has also thinned to just six or seven players with starting center Michael Cobbins out for the season with an Achilles injury and top freshman Stevie Clark dismissed from the team Monday after being arrested over the weekend. Oklahoma State could have eased the sting of Clark's loss had it managed to protect a narrow double-overtime lead made possible by some gamesmanship from Marcus Smart. With 1:40 remaining in the second extra session and Oklahoma State already up one, Smart drew an elbow picking up DeAndre Kane near mid-court and embellished the contact as though he were an Italian soccer player trying to draw a penalty kick. The refs bought Smart's sell job, Oklahoma State regained possession and Le'Bryan Nash scored two of his 26 points to give the Cowboys a three-point lead that stood until Long's shot tied the score again. Oklahoma State again had chances in the third overtime, but the Cowboys couldn't deliver on their final possession. 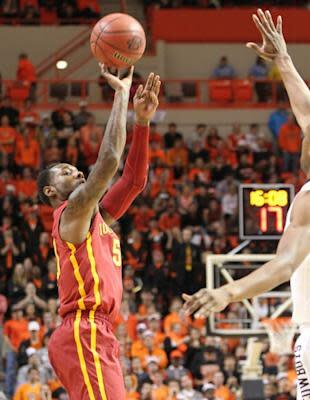 First Smart missed a late jump shot that would have given his team the lead with two seconds left, then Nash also missed a desperation shot after a tie-up under the rim had given possession back to Oklahoma State. Kane led Iowa State with a near triple-double, scoring 26 points, grabbing nine rebounds and dishing out six assists, all while having to deal with the stifling defense of Smart. Melvin Ejim had 22 points and 12 rebounds, while Georges Niang chipped in 17 points before fouling out late in regulation. Still, even on a night when Iowa State's stars came up big, none of them hit Monday night's most memorable shot. That honor went to a lesser-known sophomore whose coach had faith he could break out of a shooting slump at the most ideal time possible.